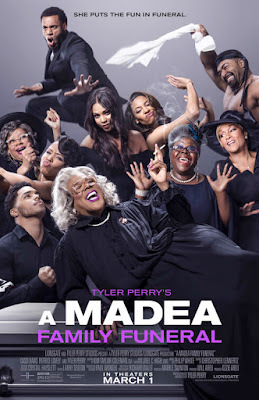 Purportedly the last film to feature his now iconic Madea character, Tyler Perry's A Madea Family Funeral is the 11th film in which the filmmaker as appeared as the character, and you can practically feel the indifference dripping off this thing. Perry has often gotten flak from critics about his lack of directorial polish, but I've always found something fascinating and personal in his work. However, the overall quality of the work has been slipping of late, especially in the last few Madea films, that began coming off the rails with the release of Boo: A Madea Halloween. Perry seems eager to put the character behind him, and A Madea Family Funeral reflects that general sense of ennui. There's nothing new here, and the same old jokes feel tired and listless. He doesn't even bother to give the film a proper ending, with Madea wandering off the porch in the middle of another argument and then cutting straight to the requisite blooper reel over the end credits. The film combines the worst tendencies of the two Boo films and Perry's usual domestic drama aesthetic. While Boo and Boo 2 moved away from Perry's brand of wholesome comedy featuring Madea's wisecracking wisdom mixed with religious flavored domestic drama, A Madea Family Funeral at least attempts to put the more serious drama at the forefront. It's "better" than Boo 2 in that it has some semblance of a plot, but unfortunately long sequences of Perry riffing off himself as no less than 4 different characters, along with Aunt Bam (the delightful Cassi Davis) and the painfully unfunny Hattie (Patrice Lovely, who has inexplicably been given more and more to do since debuting in Boo, bog the film down. The central drama, in which a distant Madea relative dies while cheating on his wife, uncovering a wealth of infidelities within the family, is nothing new in Perry-world, and Madea doesn't really do much to fix any of it. Madea has been more of an agent of chaos than a source of wisdom in recent films, and that continues here, as she mostly sits on the sidelines and complains and does little to influence the plot around her. The appeal of the character has always been her no-nonsense (and often unorthodox) brand of tough love and wisdom, but it seems like Perry has run out of ideas for her, filling the film instead with tired (and vaguely homophobic) jokes that are all set-up and no payoff. 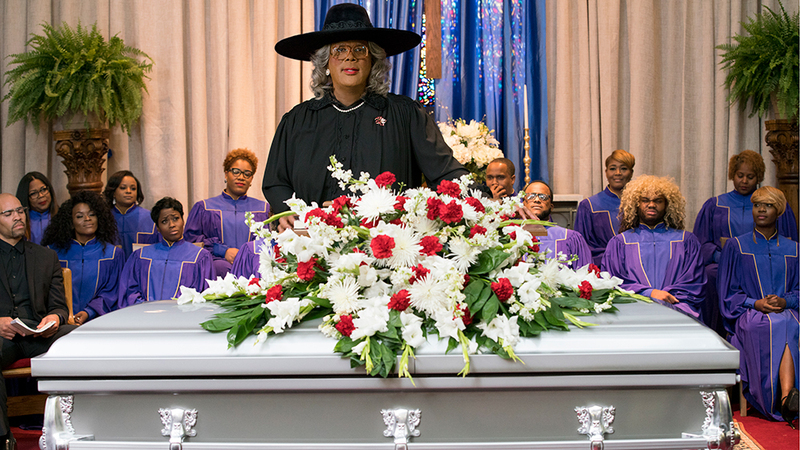 While it's doubtful that this is his final film featuring the characters (she's far too popular to put to bed forever), A Madea Family Funeral shows that its definitely time to give her a nice, long rest. 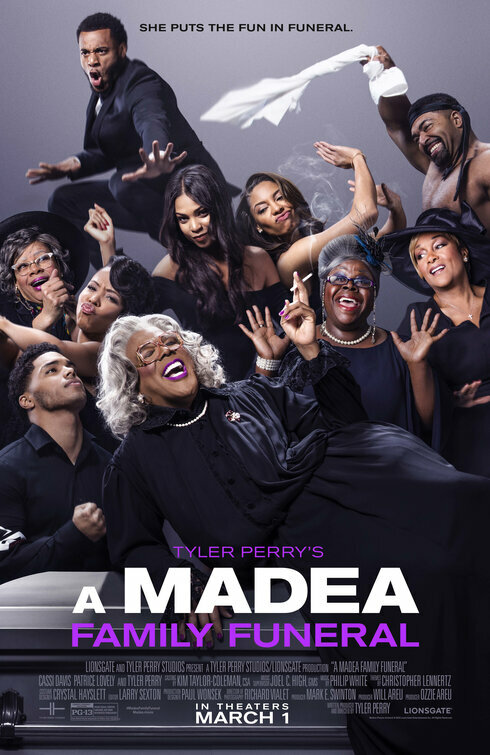 A MADEA FAMILY FUNERAL | Directed by Tyler Perry | Stars Tyler Perry, Patrice Lovely, Cassi Davis, Ciera Payton, KJ Smith, David Otunga, Quin Walters, Selena Anduze | Rated PG-13 for crude sexual content, language, and drug references throughout | Now playing in theaters nationwide.